The City of Prescott is working with Keep Amercia Beautiful, to remind citizens about what is recyclable and what is not. 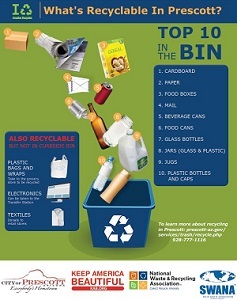 The program provides information about items that are recyclable, and those that are not. Plastic shopping bags. Try returning these to the store they came from, or reusing them. Electronics-These items can be dropped off at the City’s Transfer Station. Clothes and Textiles- Donate these to a local thrift store or appropriate charity organization. To learn more, call the City of Prescott Solid Waste Division at 928-777-1116 or visit presoctt-az.gov, and click on City Services/Trash.